Online fundraising has quickly become a necessary component of schools’ fundraising strategies - and for good reason! Donors are more comfortable giving online now more than ever and often expect that they can give online through a donation portal after receiving a direct mail or emailed appeal. In fact, online giving has steadily increased year over year, growing 7.9% from 2015 to 2016 and 12.1% from 2016 to 2017. These are impressive statistics that indicate online donations are here to stay and that schools need to integrate online fundraising strategies into their websites. Convenience is everything and that includes charitable donations. When a constituent receives an appeal from your school and she is able to click on her email to a donation page or quickly type in a dedicated donation web page, it makes charitable giving effortless. It takes mere minutes to give a donation and creates a higher return on investment for your appeals. This is especially true for first-time donors as people get distracted by having to mail a check or fill out a paper credit card form to make their gift. It encourages spur-of-the-moment giving and opens up opportunities for those who have never given to your school to become part of your active donor base. By making that first gift, your donors are expressing their interest in and commitment to your school, meaning they can be cultivated over time and hopefully become larger donors in the future. Donor acquisition is by far the hardest part of fundraising and by employing online fundraising tactics, your school can transition constituents into long-term major donors. In the world of Venmo, ApplePay, and PayPal, it’s no wonder younger generations are comfortable with online fundraising methods and prefer them to physical forms of payment, such as checks. Again, the convenience of online transfers resonates with this group. They want to check their email, read your school appeal, and make their gift in a matter of minutes. Any lag time means they’re likely to lose interest and forget about giving until they get another appeal. Online fundraising allows younger alumni and parents to donate in a way that fits with their lifestyle. 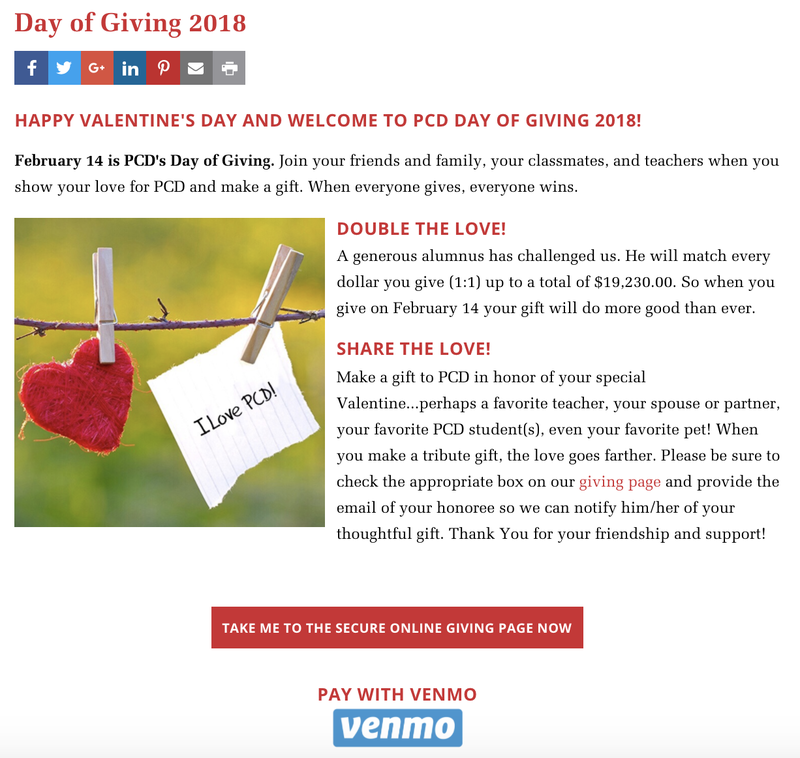 The Providence Country Day School used Venmo as a form of payment during their day of giving this year. While the landing page had a ‘give now’ option, they also included a Venmo button so donors could quickly pay through their accounts. Providence understood that their constituents were comfortable with different online giving options and delivered by tapping into the Venmo community. For schools, participation is often an important metric of their fundraising efforts as it shows community involvement and investment. Not everyone can make 4 or 5-digit gifts, but any gift is appreciated when it comes to boosting participation rates across different constituencies, such as alumni, parents, grandparents, and faculty and staff. In 2016, the average online donation was $128, which is a fairly high number when you consider the general distribution of gifts made to a school. When you add up all of the participation gifts from smaller donors, the total is impressive and significantly contributes to a school’s overall fundraising total. St. Rose High School held an annual fund matching gift challenge for their young alumni where they sought 100 gifts in order to receive $5,000 from an anonymous alumni donor. 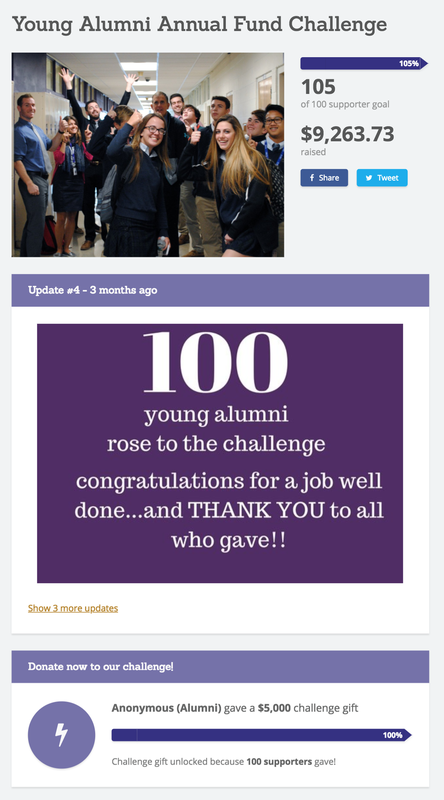 The challenge had a landing page where alumni could check the status of the challenge, see how many classmates had given, and most importantly, make their donation. This is a great example of how online fundraising efforts can pay off in a big way. As of now, larger donations tend to be made through check or bank transfer, but as online fundraising gains traction, there is likely to be a shift in how those big gifts are made. As mentioned before, convenience is key and having a dedicated landing page for your school’s online giving makes donating a breeze. Having a URL that people reference and end up on your giving page makes all the difference in the world. In fact, custom branded donation pages on a website help raise up to 6 times as much money on average. Landon has a dedicated giving page, https://www.landon.net/give/make-a-gift, which is easy to remember and easy to find when navigating their website. Using the word ‘Give’ in the navigation bar, and ‘make a gift’ in the drop-down menu allows donors to find what they’re looking for and ultimately make their gift. With a branded donation page, non-donors are more likely to give, which means you get their updated contact information. Collecting correct donor data is a challenging aspect of fundraising, but by simplifying the giving process, those out-of-touch constituents self-identify and give you their information along with their gift. This not only boosts your fundraising total, but improves the chance of repeat gifts and provides your school with a reason and means of reaching out and developing personal relationships with these new donors. Fundraising is a marathon, not a sprint, and relationship management is how non-givers become some of the largest donors, but it all starts with having the right information. Proximity to your school plays a role in how engaged community members are, but now with online fundraising, you can eliminate physical boundaries and bring your school to your constituents. With class-specific web pages that include class notes as well as donor lists, your alumni can check in, get a pulse on what’s happening with their class and their alma mater. Online fundraising removes distances and creates a virtual community for your alumni and parents that results in more gifts and greater engagement. 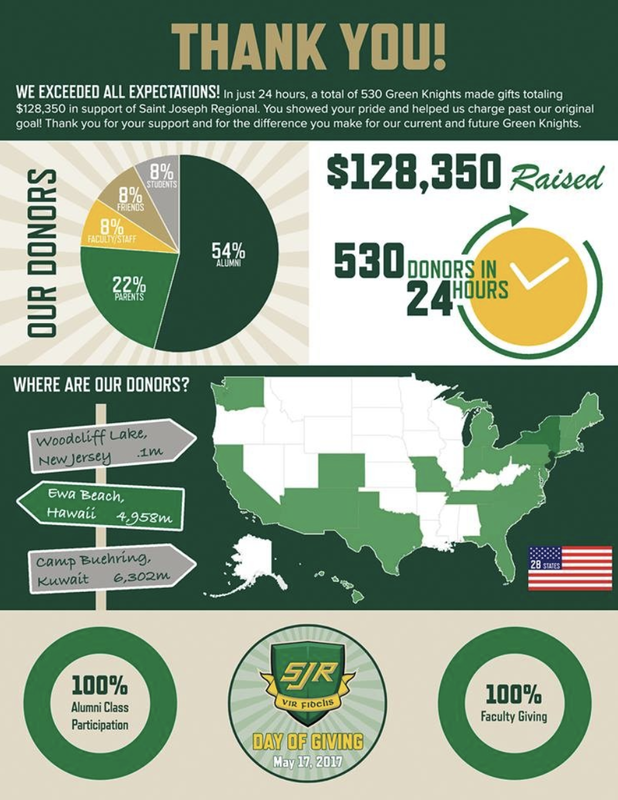 St. Joseph Regional's donor map showing donations from across the U.S.
St. Joseph Regional High School designed an infographic after its annual day of giving to showcase its wide reach around the world; the school received gifts from New Jersey to Kuwait! The day of giving created an opportunity for their online community to interact with the school and make an immediate impact. Their impressive results would not have been possible without an online donation portal. Online fundraising offers a myriad of advantages to schools. With the ever-growing popularity of online transactions and the community demand for online giving portals, it’s imperative that schools add this functionality to their website. Having a dedicated giving page as well as a ‘give now’ button on the homepage and other associated development pages streamlines the donation process and keeps charitable giving top of mind while perusing your website. The time is now to jump on the bandwagon and make the most of your fundraising efforts and appeals by incorporating online fundraising more into your school’s development strategy.